Arthur is busy with a stripper when an infected serial killer walks in on the scene kills the stripper but lets Arthur go untouched. WHY? Is this some higher Alien plot? Well, I've seen a fair bit of Sci-Fi, and to me this one weighed in at above average. I'd never say fantastic, but certainly above average. The story was a twist on the Alien Invasion theme that has been done with other series such as "First Wave"... Anybody remember that? A probe from another planet comes to earth and "infects" a small group of people on a ship with an alien signal that over time re-writes their DNA code transforming them into Aliens with super human abilities (ala 4400). These "aliens" in human form have an overriding genetic urge to propagate this signal by whatever means necessary to endure the rest of the human race join them. 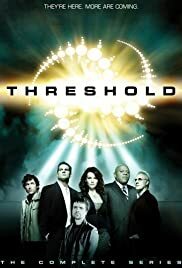 A top strategist and a select team of experts are employed by the government, under a plan called "Threshold" to counter this would be invasion. Well, first off, it does manage to give genuine creep effect in places. Some of the these moments are actually pretty effective in a way that is often so lacking in TV series. The show doesn't (didn't) shy away from a little graphic horror, which big TV networks often bawk at, especially if the show is designed to fit earlier timeslots. It was actually refreshing to see, but occasionally, admittedly, overdone as to be gratuitous. The characters can come across as a little two dimensional, but to be fair to the series, perhaps it was never given time to expand and develop them. They did try later on in the series but earlier on it was difficult to empathise with a lot of characters due to this. Having said this, no one can disagree that the characters that were supposed to come across as dislikable, really did so. None of them would have won awards for individuality, but I feel that the could have been developed in time, with the possible exception of Brian Van Holdt's character, that I found annoying at times and a little stereotypical. For me, it did seem to have a little "Cheese" factor in places. The Lettuce growing teeth springs immediately to mind. Which as mild comic relief in a well established series can work well (ala X-Files), but in a series that is attempting to get off the ground, such things can be dangerous as more serious and perhaps less forgiving Sci-Fi fans will be turned off by it. On one level the series came across as quite intelligent, but punctuating it with story's such as this spoiled the atmosphere in my opinion (And no, I wouldn't count myself as a hard-line Sci-FI fan). On the story level, it did take the alien invasion theme and try to do something a little different and interesting with it, although every now and again, especially half way through the series, I got that distinct feeling of "The Invaders" at times, though it's difficult to say where, and not give story away to those that have not seen it. The last aired episode added several new dynamics to the show, and could have taken it on to better things, giving it a more individual and unusual story thread, however, sadly, it was already too late for the show, the decisions had been made. I had been silly enough not to check to see the status of the series before I embarked upon watching it, and to say I was disappointed when I found after watching the 13th episode that there we in fact no more, would be an understatement. Not necessarily because I thought that the series was exceptional and deserved to run forever, but because I had invested many good hours getting into the story and trying to understand the characters. Networks are there to make money and we can't forget that but they seem so happy and willing to drop a show in it's first or second series if it's not spinning bucks from near inception. They know there will always be another 100 hopeful would-be shows in the wings, and one of those may make more cash. However that having been said, it's *grossly* unfair and unethical towards the audience that "support" these networks by watching, to drop a series half way through a story, and not even allow it to come to any sort of conclusion. If this trend continues I, and I suspect many others like me, will become too nervous to start watching a series in case it too doesn't spin enough cash, and gets dropped before it has really begun. I get into the mood where I want to wait until I know it's got ratings, a second series, some backing, and a future before I invest time in watching. However, over time this is surely going to end up being self defeating both for the networks and the fans that never were, as series after series will suffer in its first season with people afraid to buy into it, for fear of an unfinished story. From there ratings in first series will go down while people wait to see if it's a success or not, and so many future series that could go on to great things, and incidentally, make good money, will get canned before they have had a proper chance to flourish and fulfil their potential. There are many successful series of past years that would never have succeeded had the Network execs of today been making the calls.